You must have seen those videos of Hawaiian sweet rolls filled with ham and cheese and baked in the oven. They’re really easy to make and you can feed a bunch of people in one easy method. But what if we leave Hawaii behind and head for Paris? 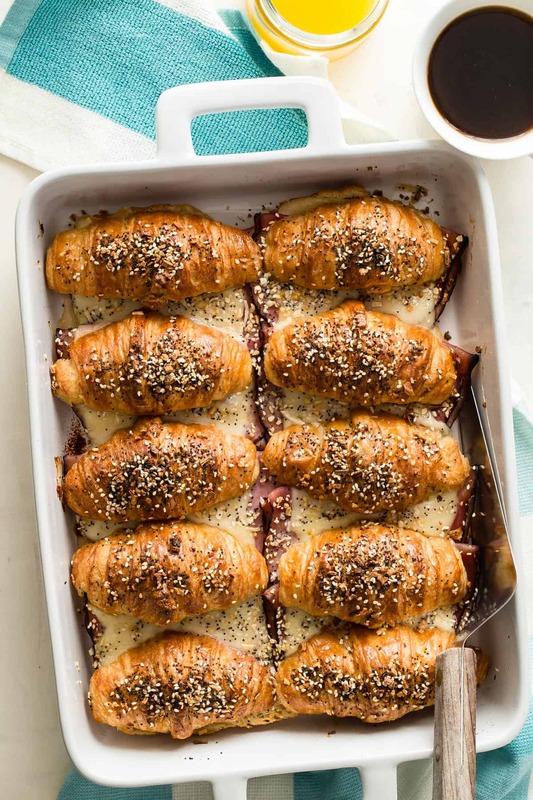 I’m talking about switching the rolls for croissants guys because today is National Croissant Day! I was stoked how these turned out, especially the croissants and how they took on a super crispy flaky texture. These weren’t fancy croissants at all, just the small soft ones from my local store. These are now on my easy breakfast items list. 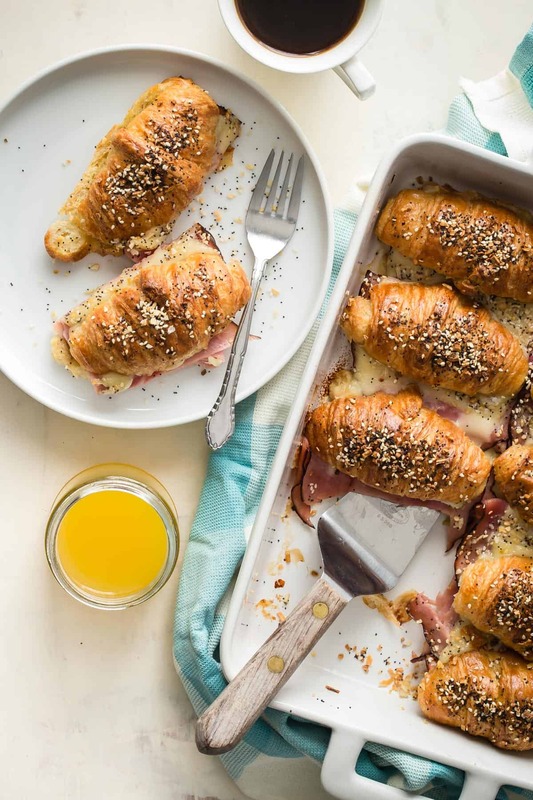 Unlike the ham and cheese roll recipe, the croissants don’t fit snug together but that’s okay because all of that gooey swiss cheese just morphs together for even more deliciousness. There’s also a layer of dijon mustard on the bottom of every croissant just to add some extra french flavor, then a layer of swiss cheese followed by a layer of smoked ham and then ANOTHER layer of cheese. Too much cheese? 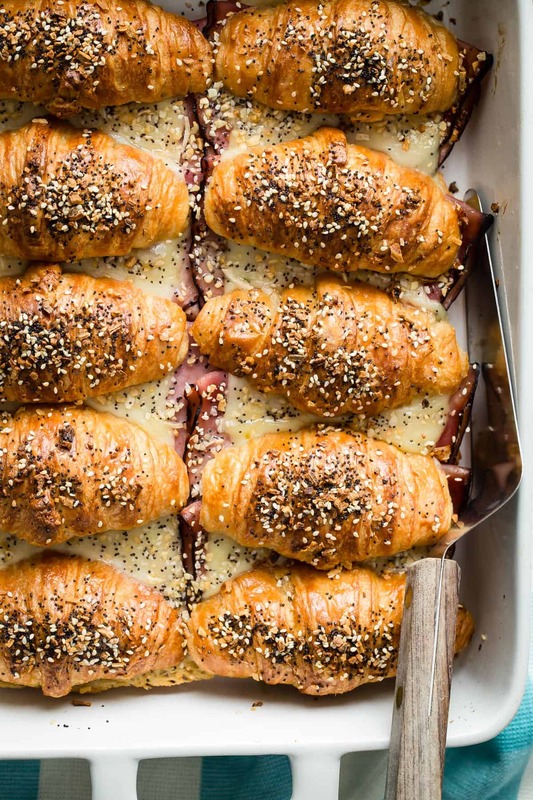 But the thing that really make these ham and cheese croissants way more special than others I’ve tried, is the everything bagel seed sprinkled over the top. Seriously friends if everything croissants are a thing and I just haven’t met them yet, point me in the right direction. If they’re not, then they need to be. Making your own homemade everything seed topping is not difficult at all. 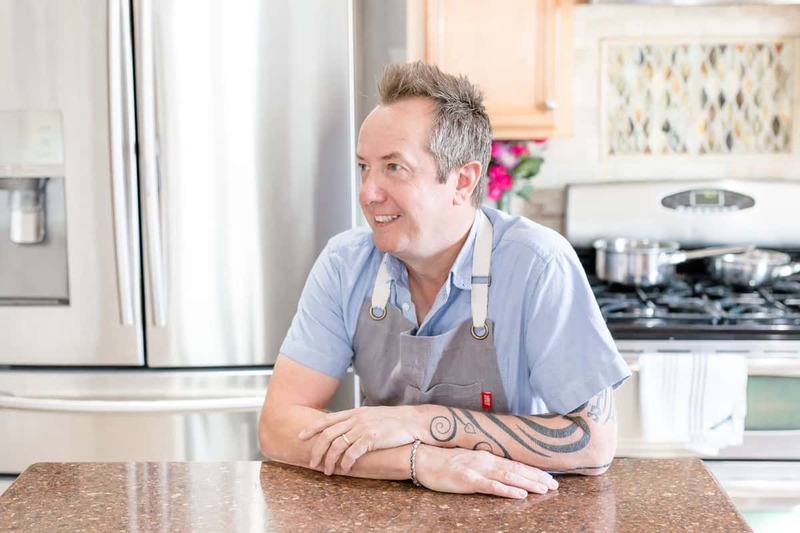 It’s even easier if your store has a bulk section where you can buy small amounts of the four ingredients. Poppy seeds, dried garlic, dried onion and sesame seeds are all you’ll need to get that authentic bagel taste. Get those Monday pants on!! This recipe will be one of my favorites. I love Croissant sandwich! Thanks Carlos!! They’re really tasty!! Do you have a recipe for croissants? 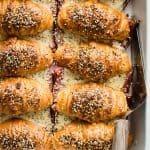 What a killer croissant sandwich – seriously mouthwatering!! This looks delicious and will be perfect when I have winter visitors (getting out of the snow and cold up north) here in Arizona! Just brilliant!